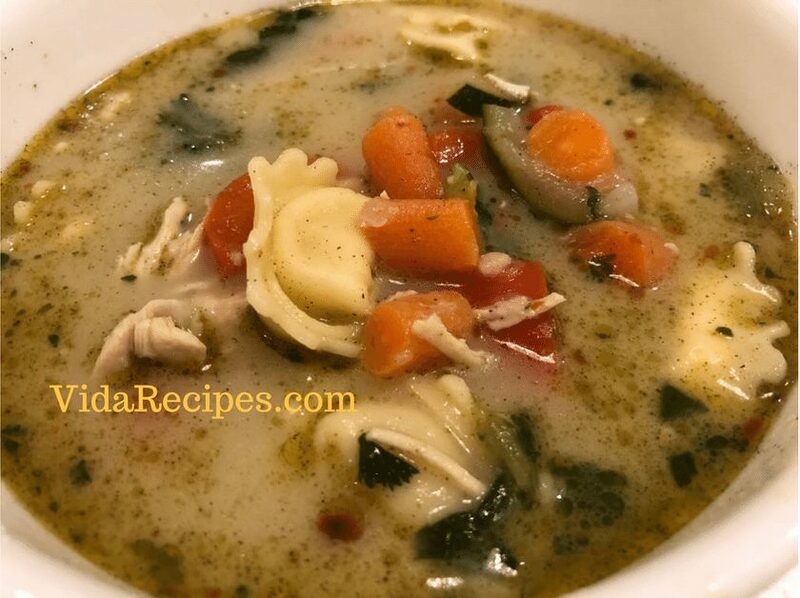 A delicious home made soup your whole family will love! Satisfying and easy to make! Place a large sauce pot over medium heat. Add the olive oil and chopped onions. Saute for 3 minutes to soften. Add the chopped bell pepper, carrots, and garlic. Saute another 3 minutes. Add whole chicken breasts, chicken broth, dried thyme, crushed red pepper, 1 teaspoon salt, and 1/4 teaspoon ground black pepper to the pot. Bring to a simmer. Lower the heat a little and simmer 15 minutes, until the chicken in cooked through. Remove the chicken and place on a cutting board. Turn the heat back to medium. With the broth still simmering, stir in the Three Cheese Tortellini. Stir well so it doesn’t stick together. Chop or shred the chicken and place back in the soup. Once the tortellini is cooked through, about 10-14 minutes, turn off the heat. Stir in 1/4 cup heavy cream, spinach, and parsley. Add a little more cream if desired. Taste, then salt and pepper as needed.